Not to be confused with Phantom. Artwork from Super Mario Advance. Phantos are large, seemingly-living masks that can often be found guarding various treasures, although they most often guard keys. Their name appears to be a shortened form of the word "phantom", another word for ghost or specter. 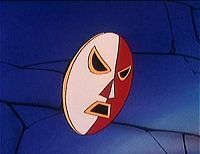 Originally, Phantos sported a very solemn demeanor in Yume Kōjō: Doki Doki Panic, while starting with Super Mario Bros. 2, it was given an evil grin. Phantos appear as semi-common enemies in Super Mario Bros. 2 (and its subsequent remakes and ports), often in caves or in jars. Phantos simply remain immobile unless the key they are guarding moves. Once this happens, they ceaselessly chase whoever stole its key. Phantos cannot be avoided and can only be escaped by using the key it was guarding to unlock a door. If the player simply drops the key while a Phanto is chasing them, it flies away and leave them alone, at least until the key is picked up again. Phanto can follow the player through different screens and rooms, even into Subspace. Phantos can only be defeated with a combination of a Stop Watch and a Super Star, as the Super Star alone does not affect it. After destroying a Phanto, however, a new one replaces it if the player enters another room while still carrying the key. A number of Phantos are also shown in various rooms, like the keys' rooms and Wart's room, though they do not do anything. Despite the sprite for Phanto being modified between Yume Kōjō: Doki Doki Panic and Super Mario Bros. 2, artwork for him usually retains his unsmiling appearance from the Japanese title. The original NES version of Super Mario Bros. 2 featured red and white Phantos, but subsequent remakes have also featured golden Phantos. In the SNES and GBA versions of Super Mario Bros. 2, larger Phantos can be seen in the background of certain jar interiors. The eyes of these larger Phantos will glow red repeatedly once the key is grabbed. In Super Mario Advance, if the player drops the key or loses a life, the Phanto appears enlarged as it flies away, creating the illusion of it flying towards the camera. Sprites of Phantos, taken from Super Mario Bros. 2, are sewed on the carpets decorating the racecourse of Shy Guy Bazaar from Mario Kart 7. A Phanto from The Super Mario Bros. Super Show!. Two Phantos made appearances on The Super Mario Bros. Super Show! The first one appeared in the episode "The Ten Koopmandments". This Phanto lived in a pyramid that Koop Tut had trapped Mario, Luigi, Princess Toadstool and Toad inside. Upon discovering the four heroes, it proceeded to chase them until they managed to escape from the pyramid. Another Phanto made a brief cameo appearance in the episode "Escape from Koopatraz", as a member of Judge Koopa's jury. Phanto background object in Super Mario All-Stars. Kamēn From 「仮面」 (kamen), "mask"
In Chapter 6-3 of Super Paper Mario, the Sammer Guy of the 63rd gate is named "Phanto Grin". 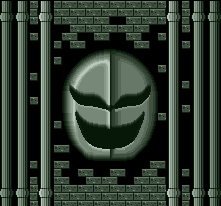 In Kirby Super Star Ultra, the Phanto Mask appears as a treasure in The Great Cave Offensive sub-game in place of the Zebra Mask from the original Kirby Super Star. An enemy called Two Face appears in Kirby's Dream Land and Kirby Star Allies, behaving the same way, although it can be destroyed. ↑ Yume Kōjō: Doki Doki Panic instruction booklet, page 32.